Willa Jaffrey is beautiful, rich, dating the perfect guy, and looking forward to a fabulous senior year. Enter mysterious Keegan Fraser, a handsome new student who wants no part of the games everyone plays at Willa’s high school. But it’s more than games that some people are playing, and despite their determination to stay clear of each other, it’s Keegan who must help Willa face some hard truths. Little does she know that Keegan’s past holds the darkest of secrets—and it’s about to catch up to him. QUESTION: You’ve established a reputation for writing realistic fiction with a focus on social issues, and Delusion Road is quite a departure from that. What happened that made you attempt a mystery thriller? 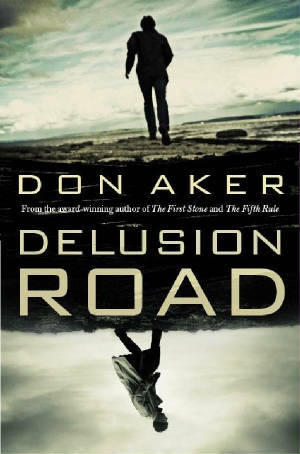 DON: Delusion Road isn’t completely different because, like my other novels, it has a social issue at its core, but you’re right—it’s definitely a departure from what I’ve written in the past. I think it’s important to push myself and try new things, whether it involves writing or anything else, because life is all about learning. I still consider myself a writer of realistic fiction, but I liked the challenge of immersing myself in a genre I’d never tried before. More importantly, the story required it—the gradual unearthing of characters’ pasts and motivations seemed organically suited to a mystery thriller. QUESTION: What motivated you to write Delusion Road in the first place? DON: When I was growing up, my parents never moved from the community where we lived, so I was fortunate to graduate with friends I’d known for many years. In fact, I attended a rural high school where everyone knew everyone else, so strangers in our midst were readily apparent. I recall sitting in an assembly during the first day of my senior year and seeing someone I didn’t recognize sitting alone a couple rows ahead of me. Even all these years later, I vividly remember thinking how horrible it must have felt for that person to be the “new kid,” having to leave all of his friends behind and start from scratch in what was supposed to be his best school year ever. That memory is one of the seeds that grew into Delusion Road. QUESTION: So there was more than one seed that resulted in this story? DON: Yes. Another is my environment. 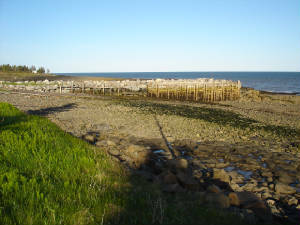 I live on the shore of the Bay of Fundy, home of the highest tides in the world, and my study where I write is only a few metres from the water. Twice each day, I see the ocean rise and fall a vertical height of more than ten metres. Not only is it an astonishing sight but the force of those tides is nearly incomprehensible. It has the kinetic potential to generate electricity for 100,000 homes if it can ever be properly harnessed—a few years ago, a test turbine costing ten million dollars was destroyed in a matter of weeks by the sheer force of the bay’s tidal currents. 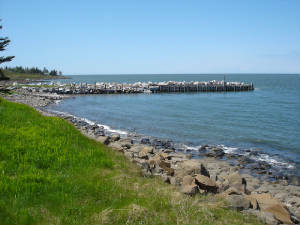 Over the years, there have been many accounts of people—usually tourists—who have gotten trapped along the rocky shoreline by the incoming tide, and I envisioned that experience being part of a larger story, which it is in Delusion Road. QUESTION: You mentioned there’s a social issue at the core of this novel. Would you care to comment on it? DON: Discussing it here would be too much of a spoiler for readers who haven't read the book. That issue is, however, the most important of all the seeds that compelled me to write the story. QUESTION: I like your title. Is there a real community called Delusion Road? DON: Yes, and it’s located not far from where I live. I’ve driven by the highway sign with that name on it countless times and repeatedly thought what a great title it would make for a story. 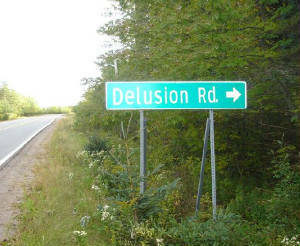 QUESTION: Does the real Delusion Road resemble the one in your book? DON: No. The road in the novel is much more similar to the one I live on now. In fact, the beach with the smooth round stones where Willa takes Keegan looks a lot like the one near my home. QUESTION: Did writing a mystery thriller involve much of a learning curve for you? DON: Definitely. In fact, it was a huge learning curve. Before I began writing Delusion Road, I spent a lot of time reading novels in that genre and seeing how successful writers craft their mysteries. That was helpful, but the only way a person can truly learn anything new is to try it and see what happens. It’s inevitable that a person will make mistakes, but that’s part of the learning process. As Albert Einstein said, “Anyone who has never made a mistake has never tried something new.” Believe me, I made plenty in my first drafts of that story. QUESTION: What was one mistake you made? DON: When I write any fiction, whether it’s a short story or a novel, my process involves layering in characters’ backstories, providing scenes that help convey a sense of their personae and how they came to be who they are. While it’s equally important for readers to have a strong sense of the characters in a mystery thriller, too much layering can get in the way of the story by dissipating the tension that’s so important in that genre. There was far too much of that layering in my early drafts. QUESTION: What made you realize that your usual process wasn’t working for you? DON: I have always been fortunate to work with incredibly talented people, and my editor, Hadley Dyer, pointed out scenes in my original manuscript that, although they fleshed out the characters, didn’t drive the story forward to the extent they needed to. QUESTION: So you had to make cuts? DON: More like slashes. Hadley asked me to shorten the manuscript by 40,000 words. DON: Wow, indeed. I had just written a novel for Scholastic’s I Am Canada series that was 35,000 words long so, in a sense, Hadley was asking me to cut a novel out of my novel. I thought she’d given me an impossible task, but she pointed out scenes that could be omitted and offered suggestions for restructuring parts of the story that, in turn, enabled me to collapse certain elements and events. I lost track of how many drafts I wrote, but Hadley responded thoroughly to every one of them, continuing to make suggestions for tightening. I didn’t cut 40,000 words, but I came very close. QUESTION: Did you find it surprising that you were able to remove so much of what you'd written? DON: Not only was it surprising, it was more than a little humbling to recognize that I could delete entire chapters—chapters I’d labored over for weeks—and actually improve the overall story as a result. QUESTION: Did you ever disagree with your editor about changes that needed to be made? DON: A few, yes, but I’ve learned to trust the people who’ve established themselves in this industry, and I made most of the changes Hadley suggested. QUESTION: What was a change that you didn’t make? DON: Hadley recommended that I cut Chapter 6 because no significant action occurred in it and any information it offered could easily be “salted” into other chapters. She was right, of course. QUESTION: But you didn’t cut it? DON: No. I liked how it offered the reader a view of the “normal” world of the Brookdale storyline. I’m a huge film buff, and I enjoy how the opening scenes of a movie introduce the “normal” world of its characters, a normalcy that will eventually be disrupted in some way by a catalyst. I liked how Chapter 6 conveys a sense of what passes for normalcy in Brookdale before things begin to fall apart, so I chose to keep it. QUESTION: Delusion Road actually has three different storylines. Was it a challenge interweaving them the way you did? DON: Everything about writing that novel was a challenge for me. Regarding those three storylines, I often felt like a mechanic dismantling a motor and then putting it back together again to see if everything worked the way it was supposed to. My biggest challenge was keeping myself from getting too caught up in one storyline at the expense of another. QUESTION: Did one of those storylines interest you more than the rest? DON: I was intrigued by all of them, but more than once I found myself wanting to leave the events in Brookdale and return to Chicago to find out what was happening with Griff. QUESTION: What do you mean by “find out”? You’re the writer. Didn’t you know in advance what was happening? DON: Some writers plan out their stories in advance before they write them, but that’s not my process. I follow rather than push my characters, discovering more about them with every sentence and paragraph and page I write. For example, when I first began writing Delusion Road, I knew that Griff would have a horrible scar on his face, but I didn’t know why—that detail just appeared as I was creating him. And I had no idea how he’d gotten it. But I trust my process and just forged ahead, expecting that at some point all of that would become clear. I was more than a third of the way into the manuscript before I discovered what had happened that resulted in his scar. QUESTION: The scene that shows how he got it is gruesome. Was it tough to write? DON: Just the opposite. That one came faster than most of the scenes in the book. And I made very few changes to it. What you see in the published version is very close to what appeared in my first draft. QUESTION: Why do you suppose you found it easy to write? DON: In order for Griff to become the cold-blooded killer that he is at 20, I knew he had to have experienced something horrendous in his past, and I couldn’t imagine anything more traumatic than what happens to him in that trailer on Lancelot Way. QUESTION: Where did Lancelot Way and Guinevere Lane come from? In fact, where did the whole Camelot Trailer Park come from? DON: I wish I knew. I placed Griff and his mother in a trailer park because it was a natural reflection of their socio-economic level, but those names just appeared on the page. When I’m writing, my subconscious mind frequently makes connections that I only come to understand later, and I guess what appealed to me about those names was the irony inherent in them. Camelot was the legendary kingdom of King Arthur, a world typified by sweeping acts of bravery, honour, loyalty, and love, and Griff’s life in that leaky Arkansas double-wide was the antithesis of that. I guess my subconscious appreciated the contrast that those names suggested. QUESTION: Would you say that Keegan embodies the world of Camelot? After all, isn’t he Lancelot, the knight in shining armour? DON: That’s an interesting observation. To be honest, I really hadn’t thought of him that way. To some extent, I guess he could be viewed as a Lancelot figure because of the value he places on loyalty and honour—both drive Keegan to protect the people he cares about. But to my mind, Willa is the true hero in Delusion Road. QUESTION: I want to ask you about some of your minor characters. This isn’t the first time you’ve created a person who is challenged in some way. In your novel The Space Between, your main character, a guy not much older than Keegan, has a younger brother with a disorder similar to Isaac’s. Why bother covering the same ground? DON: I think it’s important for the world of any story to reflect the world in which readers live. Because more and more young people are being diagnosed with autism spectrum disorder, it stands to reason that more characters with this disorder should appear in the stories we read. In fact, shortly after The Space Between was published, I was contacted by a woman who thanked me for including Lucas in that novel—as the mother of an autistic child, she was grateful to see a character very much like her son in a story. I also like the contrast between perception and reality that Isaac’s character in Delusion Road offers the reader. Isaac struggles with conventional communication, but in some ways he communicates more effectively than Keegan—certainly with their father, anyway. QUESTION: I was surprised by Clovis Lafayette. Why did you decide to include a senior citizen in a novel whose characters are mostly teenagers? DON: Griff had trouble relating to people his own age, which was reflected in the bullying he did at school, so it seemed logical that he might be better able to form a relationship with someone who wasn’t in his peer group. And because he had no father and Marsha Barnett wasn’t much of a mother, I felt that Griff might subconsciously be searching for a parental figure—in many ways, Clovis was the grandfather that Griff never had. With so much wrong in his life, it seemed important to give him something positive, and his relationship with Clovis was the only good thing he had going for him. QUESTION: So you didn’t create Clovis just to give Griff a reason and a means to become computer savvy? DON: No, I didn’t. That’s just how things worked out. Like I said before, I don’t plan in advance what will happen in my novels—not consciously anyway. I’ve learned not to question or analyze what appears on the pages of my first drafts. I just trust that, as the story progresses, things will evolve as they need to. I know a lot of older people who struggle with technology, so at the time I thought it was only natural that Clovis would ask Griff for help with his computer. It wasn’t until Clovis asked for this help that I could foresee the direction Griff’s life might take as he became more fluent with programming. QUESTION: Earlier I mentioned the novel’s three storylines. Did you find it difficult writing from three very different perspectives? DON: Maintaining consistency of perspective is always a challenge for me, even when I’m writing from a single viewpoint. Writing from three different viewpoints magnified that challenge, which is why I’m so grateful to have an editor as keen as Hadley Dyer. She immediately spotted instances when I deviated from the voice I’d established for each character. QUESTION: Was there a particular scene in the novel that you found especially difficult to write? DON: Yes, and it was because of that issue of perspective you just mentioned. At the beginning of Chapter 65, I wanted readers to know what was happening to Keegan, but it wasn’t easy conveying that information from his perspective because he was unconscious at the time. I couldn’t simply insert an omniscient narrator for this purpose because no such narrator appears anywhere else in the novel, so I struggled with the problem of maintaining a sense of realism in terms of Keegan’s physical situation while, at the same time, providing the information that readers required. I finally solved the problem by having Keegan drift in and out of consciousness, and I’m pleased with the result. QUESTION: Do you think you’ll ever write another mystery thriller? DON: I really don’t know. I hope so because it would be a shame not to put everything I’ve learned to further use. But it all depends on the seeds that motivate me to begin any writing project as well as on whether the nature of the story requires that particular narrative framework. I guess we’ll have to wait and see.